If you are looking for a ceiling fan that is a bit more run-of-the-mill then you have come to the right place. 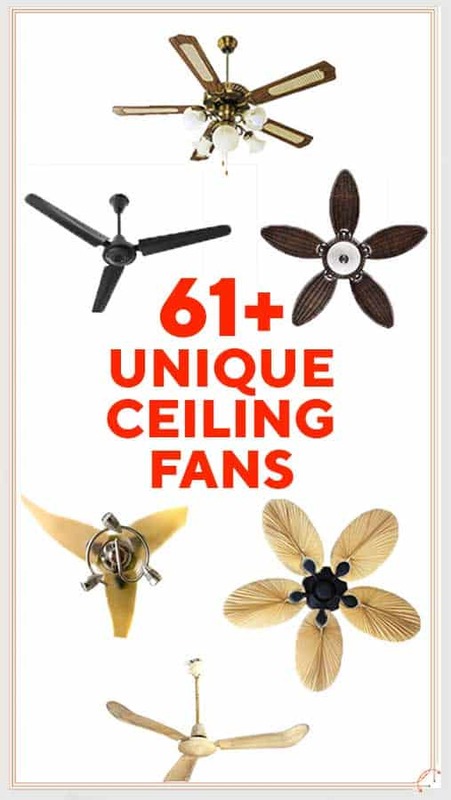 Below we have comprised a list of 61+ cool and unique ceiling fans. Having perused many ceiling fans we have also picked out a few of our favourites. The Monte Carlo Dylan Ceiling Fan has one of the largest airflows and efficiencies of the fans listed, so if you are looking for serious air, check it air. The Hunter Symphony is one of a few smart ceiling fans available. Although taste is completely subject, check out the slick propeller fan from Casa Vieja. There is a lot of variation out there and the are many similar but different options available in some styles. An example is the leaf fan. There are a number of styles from various manufacturers, however, we have only given one for reference. So if you like one style of fan here, have a good look around as there may be different sizes/colors/styles of that type of fan available. We have also included some basic stats of each fan so you can easily compare and get a quick overview of each fan. While we have made every effort to have as accurate data as possible please always consult the seller or manufacturer for the actual stats as there may be some discrepancies here. This fan is a slick looking modern looking fan which is available in brown, silver or white colors. Its unique design is in its curved blades or variable fan blade pitch which gives it its sleek modern look. You are also able to control the lighting on the fan with a 17W dimmer. The good news is also that with this fan the lighting is LED so you will use minimal power with the lighting unlike some halogen lighting kits with other fans. The fan comes with 3 speeds and a handheld remote control for easy control. A wall control can also be purchased in order to control the fan’s speed and light dimming from the wall. It is a UL listed indoor rated fan so you won’t be able to use this outside. The good news is that this fan is reversible however in order to reverse the fan you have to do this manually on the fan unit itself. Over this fan has fairly positive ratings. The Westinghouse almost looks like some sort of weapon out of a science fiction movie rather than a ceiling fan. This cool ceiling fan boasts only 2 blades which are a move away from the traditional ceiling fan which generally has 3 or more. With this fan, you get 4 fan speeds as well as the all-important all year round switch (which reverses the fan direction). Inside the lighting case is 2 lights which are candelabra base 40-watt torpedo light bulbs. Although it does not come with a remote control you are able to purchase a compatible remote separately. This 48-inch fan is recommended for a 12×12 room or less. The fan is controlled directly by 2 pull chains. One for the light and one for the speeds. It is UL listed for indoor use. This cool fan comes Westinghouse fan comes with quite favorable ratings. Check out what people have to say. If you are looking for something a bit different why not look at a double fan. This aptly named Harbour Breeze Twin Breeze fan has a sleek oil-rubbed bronzed finish but the best thing about this fan is that it is UL Wet Listed. Yup, that means you can use this double fan in wet locations. It comes with 3 speeds and a light kit which takes Candelabra base bulbs. Being 74 inches in total the fan is recommended by the manufacturer for rooms that are 400m2 or more. You are able to purchase a remote control separately if you need more convenient controls. This fan has good ratings from consumers. See what people have to say. This 46-inch ceiling fan oozes decadence and style and certainly draws attention to the design of the fan. So much so that it can become just a centerpiece light with the ability to have the blade fans retract – hence the name Invisible fan. This unique fan saves you power with LED lighting and is UL listed for indoor use only. There are 4 blades all of which are clear which keeps attention firmly focused on the design. You can control the airflow with 3 speeds. Find out more. If you want a bit more discretion with your fan you could try the Brette 23 Inch ceiling fan. This unique drum style fan has no visible blades and contained within the frosted glass are 2x 23 watt LED light strips, great for saving power on lighting. The lights are also dimmable and easily controlled by the included remote control. With the remote, you are also able to adjust the speed of the fan independently of the light too, a feature many other fans do not offer. It has 3 speeds and the fan is also reversible so you can add more comfort to your room all year round. There are a few different companies making this kind of fan so you have options in terms of brand and with style. Check out what people are saying. The Westinghouse 7224300 Quince almost looks like a small plane’s turbine. It boasts 6 blades and comes in 3 colors; chrome, gunmetal, and white. At only 24 inches, the fan is compact and recommended for rooms around 10×10 feet. The motor is high quality and energy efficient and backed with a lifetime warranty. You can keep your room more comfortable all year round as this fan is reversible. The 7224300 Quince comes with 2 lights that use Incandescent bulbs. There are 3 speeds on the fan and although it does not come with a remote control, it is remote control adaptable should you want the extra convenience. Being a more well-known brand it comes with pretty good ratings. See what purchasers have to say about it. Update your decor with this 56-inch ceiling fan with 2 rosewood blades with antique pewter. It will keep your room more comfortable all year round with the ability to change fan direction. It comes with a remote control unit which can control the speeds of the fan. There is no lighting feature so this fan focuses entirely on moving air for your comfort. Not only is the fan El Listed, its CSA listed and best of all Energy Star listed which means great savings on power. This unique ceiling fan is easy to install and comes in a medium range price bracket. See what others are saying about it. If you know your warplanes you will recognize this Tiger Shark from the P-40s used in WWII. As far as cool ceiling fans for the kids go its right up there. Available in 42 and 48-inch sizes there are also a number of other similar plane variations available. The fan has 3 speeds and is also reversible so you are able to make your room warmer during winter. The integrated light kit comes with a 60-watt candelabra bulb which is controlled by a pull chain to turn the light on and off. This fan is a must for those with young aviation enthusiasts in the house. Check out what others have to say about it. As far as fans this is one of the more unique ceiling fans out there. With 2 completely non-traditional type blades, it still moves a lot of air with 6085CFM. With a modern asymmetrical modern look to it, it would certainly be a head turner in any home. The blade pitch is 12 degrees and has a silver finish molded on ABS blades. The fan also has an economical lighting fixture which uses a 17 watt, dimmable LED light which is a solid 1429 Lumens. Available in silver or white, the Possini fan also comes with a remote control for your convenience. Although it is a bit more expensive than the average fan, those who have got a good unit have been fairly satisfied with the fan. See what others are saying here. I’ll be honest, I’m still not entirely sure how this one works, but apparently, it does. at 5571 CFM it blows a good amount of air. This unusual ceiling fan is also quite highly stacked with features too. It runs has a DC motor which means it is a whole lot more energy efficient than AC motors that many other fans use. It has 6 speeds and again, unlike many other fans, has a remote control which can control the direction of the fan, so you can stay cool in summer and warm in winter. The great majority of fans require you to flick a switch on the fan unit itself to change the fan direction so that is a big plus for this fan. You are also able to add a light kit to this fan in case you need more illumination in the room. Not only can you use this fan indoors, but it can also be used outside. Some high-quality features from a very cool ceiling fan. Find out more. The Casa Vieja Capri almost looks like a giant shuriken and who wouldn’t want a giant shuriken cooling their room? This stylish 5 blade silver, brushed nickel fan comes with a light kit included. The lighting is comprised of 2x 13w standard CFL bulbs. The fan comes with a remote control to control the lighting and the 3 fan speeds. The fan is also reversible so you can help warm the house in winter, with a switch on the fan unit itself. The fan comes highly rated by consumers who have bought the unit. Find out more here. Like something out of a science fiction movie this 54 inch Minka Aire ceiling fan comes in polished nickel and brushed nickel finishes. The fan comes with 3 speeds and is also able to be reversed all at the control unit on the wall. It also comes with a light kit which takes a 50 watt MR 16 halogen bulb which can also be dimmed and controlled with the wall unit. The fan is UL Listed and you are also able to purchase a compatible remote control should you require more portable control. If you are also wanting to have the light fixture more energy efficient you could replace the bulb with a LED of the same voltage. Find out more. This cool ceiling fan made by Kichler comes in 3 different styles, the brushed nickel, polished nickel and oil-rubbed bronze. It is a DC motor so is likely going to be a very quiet fan and more efficient than Ac fans (up to 70% according to the manufacturer). It also has a blade pitch of 28 degrees which is a whole lot more than the standard fan. This means it’s likely to move more air, but the motor will work a lot harder for it. Luckily it’s a DC motor! The fan is UL rated for indoor use and it comes with a remote control. With the control, you can change the fans 6 speeds. A wall compatible switch is also available separately should you want wall control of the unit. No lighting is available for the unit, however. Find out more. Good things come in threes probably why the name FX3. It has 3 fan heads which have 3 blades each and are able to be controlled with 3 speeds. This fan has silver blades with a brushed steel finish. You are able to control the unit via an included remote control. It has a white frosted glass light kit which contains 2 13 watt CFL bulbs. The fans have an 18-inch blade span and 20-degree blade pitch which is a little more than the average fan. Find out more. Another option in the long list of unique ceiling fans is the TroposAir Voyage ceiling fan. This unique fan actually uses khaki fabric for blades giving it a nautical feel. Given that, it is also indoor and outdoor rated so is rated for outside covered use. It has 3 speeds and is also able to be reversed for your comfort all year round. If you are wanting easier control or you want to add some ambiance then the fan is remote control and light kit adaptable, both of which are sold separately. Find out more. This fan is a bit meta with fan styled blades as fan blades. It can be used indoor and outdoors as it is UL Damp rated and CSA listed. It has 5 fan blades and a bowl light kit which takes 3x 14-watt medium base CFL light bulbs. It has 3 speeds and is controlled by a pull chain. It is also a reversible fan so it be can be used to cool in summer and help warm in winter. A remote control is able to be purchased separately if you are looking for more convenient controls. Find out more. In a similar vein to the Hampton palm fan, this cool palm fan from Gulf Coast not only looks unique but moves a lot of air. It is damp rated for indoor and outdoors use and has 3 speeds which are controllable by a pull chain. It is reversible for use all year round and takes standard 60watt light bulbs but can also take LEDs if you so desire. You are able to purchase a remote control separately should you want more control options. Find out more. There are a few different western style ceiling fans available which are very unique. This fan, in particular, made by Copper Canyon comes in a few different sizes starting from 44′ and getting up to 60′. The fan has 3 speeds which are controlled by a pull chain. It is light kit compatible and is also reversible for those winter months when you want some extra help keeping the house warm. You are able to get a number of different designs also as they are one of the more custom built type fans. Check with the supplier. Find out more. If you liked the look of the palm blade fans, why not just double get double! It comes with two high-performance motors and is also rated for damp locations so can be used in an outside covered area. A wall control is also included. The cool thing about this fan is that you are able to move the blades into multiple positions. 90 degrees 45 degrees or straight. You are also able to purchase a light kit separately. Find out more. Another fan for the more serious aviation enthusiast, the Mustang II from Tropos Air’s design is inspired by the P82 Twin Mustang of WWII. It features 2 small form energy efficient motors along with an integrated light kit. The lighting is made up of 2x 13 watt CFL bulbs. The fan has 3 speeds and comes with a convenient remote control. The fan is indoor and outdoor rated. Find out more. This cool windmill rustic style ceiling fan comes in a number of different sizes all the way up to 72″. The fan contains 15 blades and also has 6 speeds. The fan is reversible for all year round use and comes with a wall control. Find out more. If you like baseball, this fan is for you. 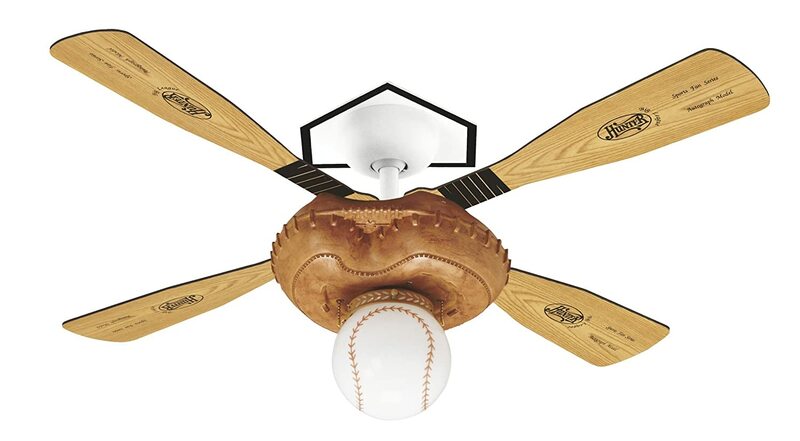 This baseball themed ceiling fan not only feature a bat, mitt, and ball, but you are also able to get baseball themed pull chains to accompany the fan. The fan has 4 speeds and is also reversible for use all year round. It is also made by Hunter, a very reputable a long established ceiling fan brand known for good quality fans, so you can be sure it is more than just a cheap gimmick fan. The lighting is comprised of one 19-watt CFL bulb and can be excluded if need be. A remote control is also purchasable. Find out more. This unique contemporary ceiling fan from TroposAir measures 52 inches and comes with a handheld remote for easy control. The remote also controls the integrated 75-watt halogen light. The fan also comes with a cover should you not want any extra light in your room. Find out more. The Air King 9718 is unique in that it is one of the smallest ceiling fans available. Despite its small stature, it is a very powerful fan for its size. The fan has 3 speeds and is operated by a pull chain. It is ETL and OSHA approved. Find out more. Much like the Air King above, this is quite a small fan in size. The Valdosta also comes with 3 speeds which are controlled by a pull chain. It can be used indoors and out and is EL certified, CSA Certified and also has the Energy Star certification making this fan extremely energy efficient. It is reversible for use all year around. Find out more. There are a number of Rustic Ceiling fans available and this unique fan with a reclaimed wood finish is able to fit into a rustic environment, indoors and outdoors. Coming with an integrated light kit which takes 1 Mini-Can H-type bulb, it has 3 blades and variable speed settings. Reversible for your comfort all year round, the fan also comes with a remote control. Find out more. Looking more like something you would have in your kitchen to mix your smoothy, this cool ceiling fan by Kichler is centered around the integrated light kit. It comes in three styles, white, brushed nickel and oil rubbed bronze to suit whatever decor you may have in your room. It is a variable speed fan and takes energy efficient LED lights. It is also ETL Listed. It comes with a remote control which controls the speeds along with the lighting which has is able to be dimmed. You will have comfort all year round with the ability to reverse the fan. Find out more. Looking like a flying saucer, this 24-inch ceiling fan from Possini has an 18-degree blade pitch and can be sloped in two directions to direct the airflow more conveniently. It comes with a remote control with which you can control the fan speeds and lighting separately. The lighting is comprised of five 35 Watt Halogen GU10 base bulbs. There is no reverse function on this fan. Find out more. This cool, modern ceiling fan by Westinghouse comes with the quality and style Westinghouse are known. Its light kit is what makes this fan unique in that it is not integrated as such, like a lot of other fans. It has a 3 light track kit with adjustable spotlights and uses 50-watt Halogen bulbs. It is recommended for rooms up to 360ft2. It comes with 3 speeds and is also reversible so it can bring your home comfort all year round. You are able to purchase a remote control for this fan separately. Find out more. As far as unique ceiling fans go this has to be one of the most unique but also made by one of the top brands, Minka Aire. This fan will get people talking. The Gyro style fan comes with twin turbofans and has 3 speeds controllable from the wall. It has an integrated light kit which can also be controlled from the wall and is dimmable. It takes 1x 100 Watt (E11 base) Halogen bulb and is also reversible for all year round comfort. It is also UL Listed. Find out more. This cool modern ceiling fan from Fanimation comes in a metro gray finish or white. It has 3 speeds and is reversible for all year round use. You are able to control the fans speeds with the included remote control and also the integrated light. The lighting is comprised of 2 candelabra bulbs and is dimmable. The fan is UL listed and is also rated for indoor and damp locations. Find out more. If you are looking for something a bit more old school you can’t go past a look at the Fanimation Brewmaster ceiling fan. This unique ceiling fan is UL-rated and is also rated for damp locations. It also comes with a remote control. Find out more. This unique indoor ceiling fan has antique woven bamboo blades. It spans 52 inches and comes with both a remote control as well as a wall mount control for your convenience. Find out more. 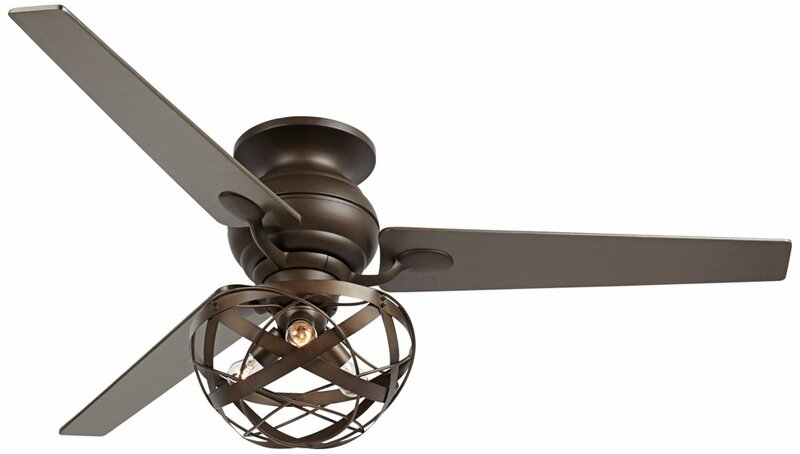 Another cool ceiling fan from Fanimation the Avaston comes in an oil-rubbed bronze or satin nickel finish. It spans 52″ and is UL listed for indoors and also damp locations. It is a variable speed fan and an integrated light kit which uses 2x 50w halogen bulbs. It also includes a light cap if you are not wanting to have the extra light in your room. It is also reversible for use all year round. Find out more. This funky ceiling fan aptly named the Jellyfish has all the trimmings. It comes with 3 speeds as well as a remote control which has the ability to control the full range of the light dimming as well as the reverse function so you are able to use the fan all year round. The 3 blades made of clear acrylic and a light bulb with a clear acrylic lens. The fan is also UL Listed. Find out more. ‘Blossoming like a flower’ as one customer puts it is what makes this ceiling fan from Monte Carlo unique. The fan blades fold down over the lamp when the fan is off creating somewhat of an ornament in itself. When the fan is turned on it ‘blossoms’ with the fan blades extracting out to take care of their job blowing air. The fan has an integrated light kit which takes 1 x 100-watt incandescent bulb and comes with a remote control of which you can control the lights, speeds and also the direction of the fan so you can use it all year round. The fan has 3 speeds and is UL Listed. Find out more. This one is for the basketball fans in the house. This cool ceiling fan comes with an integrated light kit which takes and 18 W CFL bulb. The fan has 3 speeds and comes with a remote control with which you can control the light, speeds and also the fan direction. So this fan is also able to be used all year round. Find out more. This ‘bloom’ ceiling fan is great for the kid’s rooms and comes in a number of different colors. It also extremely power efficient at only 13 watts which give it an energy star rating. The fan has an integrated light kit which takes 2 60-Watt candelabra bulbs. It has 3 speeds, is also reversible for all year round use, comes with a remote control and is UL rated. Be sure to check out all the different colors. Find out more. On the exterior, this looks like just a reasonably standard modern ceiling fan, but this is no ordinary ceiling fan. This fan from Hunter is one of only a couple of ceiling fans that have smart capabilities. The fan comes with a remote control, dimmable LED lights, 4 speeds and a reversible motor so you will have all round use of the fan. It is also Wi-Fi enabled with support for Apple HomeKit technology. Welcome to the world of home automation. Find out more. If you are looking for other smart options Hunter has a few smart options available and also HaikuHome have a smart ceiling fan available. We’ve had the flora, now for the fauna. This Monte Carlo Butterfly ceiling fan comes with a handheld remote control and has 3 speeds as well as a reversible motor for all year round use. It is UL rated and also rated for damp locations. It has a light kit which takes halogen bulbs. Find out more. Available in metro gray and walnut finishes this 1 blade ceiling fan is about as unique as ceiling fans come. Some might say an enigma. Not only is it UL rated but it is energy star rated for extremely cost efficient use. It comes with a remote control and can also damp rated. It has an integrated light kit which takes a halogen bulb as well as 3 speeds. Find out more. This unique 1 blade ceiling fan whose design is inspired by nature itself comes in 2 sizes: 54inch and 60 inches. The fan is reversible so you are able to use the fan to bring comfort all year round. It is compatible with a wall control or remote control. Find out more. Perfect for a saloon or western setting this wagon unique wagon wheel ceiling fan comes in 52inch and 60-inch sizes. The light kit is optional and the fan comes with 3 speeds. It is reversible so you can use the fan all year round. As you would expect from a western style ceiling fan like this, the settings are controlled by a pull chain. A certain conversation piece for any house, the fan can be customized to suit with different blade colors & styles, blade arm medallions, light kit and remote control. Be sure to look out for the other options. Find out more. The Kichler Pall Ceiling fan comes in a number of different styles. It is UL listed and is light kit compatible. The light kit takes 6 halogen lights. The fan has 3 speeds which are controlled by the CoolTouch Control System. Find out more. The Hampton Bay Pilot is unique in that it has 2 sets of blades for counter rotational wind movement. The top blades move in one direction while the bottom move in the opposite. It has an integrated light kit which takes a 100W halogen light bulbs and comes with a remote control. It has 3 fan speeds and is reversible for use all year round. It is UL listed for indoor use. Find out more. Looking for something a bit more decorative? This elegant and sophisticated ceiling fan from Casa Vieja comes with a chandelier style light kit with decorative crystals. The lighting is comprised of four 40 watt candelabra bulbs. It has 3 speeds and comes with a wall control but is also remote control compatible. It is also reversible for all year round use. Find out more. This cool contemporary flush mount ceiling fan from Matthews has 3 walnut stained wooden blades. It uses a quiet DC motor for energy efficient use. It has 6 speeds and is reversible and can be controlled by handheld remote or by wall control. It is also damp rated as well as UL listed. Find out more. This rustic style ceiling fan from Monte Carlo uses a DC motor so you know it will be energy efficient. It has 6 speeds and is reversible for year round use and also comes with a remote control for your convenience. It is rated for damp locations and has a large CFM rating which means it moves a lot of air. Find out more. Probably one of my personal favorites in terms of looks this slick looking propeller type ceiling fan comes with 3 speeds and has a manual reverse option for all year round use. It comes with a wall control and is light kit compatible. It is also available in a number of finishes. Find out more. With the design inspired by a beehive, this 42-inch ceiling fan from Modern Fan is certainly an eye catcher. It has a maple finish and comes with an integrated light kit. The light kit is comprised of 1x 75 watt halogen light bulb. It has both a handheld remote control and also a wall unit for convenient control. Find out more. Bring the ninja out from inside of you with this Shuriken style ceiling fan from Kichler. This fan takes LED lighting in its light kit making it very energy efficient. The fan has 3 speeds and is UL rated for indoor use. Find out more. This cool, unique antique ceiling fan from Casa Vieja comes with a bowl light kit with frosted glass. It has a remote control which you can control the speeds and the lighting. The lighting consists of three 40 watt candelabra bulbs. There is also a lighting cap for those that don’t require the lighting. It has 3 speeds and is not reversible. Find out more. This unique chrome finish drum ceiling fan comes with a remote control to the light and speeds. The lighting consists of 6 13-watt medium base CFL bulbs. It has a white diffuser which helps eliminate glare and ensures even, ambient lighting when illuminated. Find out more. This contemporary brushed nickel finished ceiling fan from Casa Vieja comes with and integrated light kit that takes one 75 watt GU10 bulb. It has a remote control which controls the lighting and 3 speeds. It is also reversible for use all year round. Find out more. This unique and stylized, weathered zinc ceiling fan from Kichler lighting also comes in a couple of other styles. It is a variable speed fan and comes with a number of different light kit options. It is UL listed and damp rated and is controlled by a traditional pull chain. It takes LED lights for extra energy efficiency. Find out more. This pull chain fan from Vaxcel comes in a couple of different finishes including this oil-rubbed bronze. The lighting consists of 3x 50W GU10 Halogen light bulbs. The fan is UL listed and has 3 speeds. Find out more. Minke Aire make a lot of cool ceiling fans and the Uchiwa is no exception. This unique ceiling fan has an integrated light kit which includes 1x 75 Watt Mini-Can Halogen bulb. It has a 3-speed wall control and is also reversible for use all year round. It also comes in a few different styles and finishes and is UL listed. Find out more. This cool ceiling fan with contemporary look comes with 6 speeds and a full function wall control. It has an integrated light fixture which uses two 50-watt candelabra bulbs as well as having a light cap if you are not wanting the extra lighting. It comes in 4 different styles/finishes and is reversible for all year round use. It is extremely energy efficient. Find out more. This ceiling fan from Casa Veija comes with a number of different unique style light kits. at 60 inches it’s a big fan which can provide big light with the 5 bulb light kit. The lighting consists of 5x 13 watt CFL bulbs. The fan is operated by pull chain and also has 3 speeds. It is also reversible for year-round use. Find out more. We hope you enjoyed the list of unique ceiling fans. If you think there is something we can add to the list or if you just want to leave a comment feel free to do so below, we would love to hear from you! I couldn’t be without the ceiling fans. I would love to trade them out for chandeliers but living in Florida a fan is more practical. I have Hunter fans and they are great. But when I decide or need a new fan I will check into Craftmade.